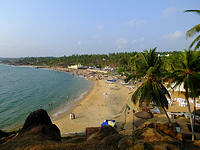 It was a long 4-5 hour drive to Kovalam. We stopped half way for our lunch break. Our driver suggested a local hotel restaurant. He stopped at a local hotel in Bandlam and suggested their Nalukettu Restaurant for us. It looked fine with a sign at the front 'seafood specialist'. We entered and found ourselves the only foreigners in the restaurant among many local people. This is always a good sign for a restaurant. We ordered some dishes from the menu. This turned out to be the very best meal we had throughout our two week trip. Two dishes stood out as the best, The first was the Karimeen (fried fish wrap in banana leaves). I had this dish in several places but this is not comparable. It was so delicious full of spices & taste. Second was the vegetable dish that we ordered and it turned out to be deep fried aubergine and cauliflower. Shivan told us that he did not know this restaurant but just chose it for us as we were passing. We were grateful to him. 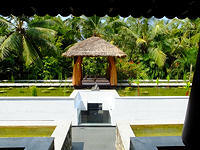 We arrived at Kovalam in the afternoon and checked in at the The Leela Resort. This is a large 5* beach resort complex. There are two wings of accommodation. The sea view rooms are in the main building on the hill. The garden rooms are a road down about 5-7 minutes walk from the main building but near to the beach. The two complexes each have their own swimming pool although both can be used by guests in either wing. There is a third pool for club floor room guests only. The hotel has its own beach but it is next to the public beach which was extremely busy on the Sunday we arrived as it was a local holiday weekend plus a local wedding party at the hotel's beach restaurant. We were staying at the garden wing. The room was very large and divided into two levels. The first level is the entrance & bathroom with steps down to the second level, the bedroom. The room is simple and elegantly designed with red wood furnishing matching the garden room theme. Outside the room is a patio for sitting with view of the landscaped gardens and swimming pool. The garden wing is just a few steps across a narrow road to the hotel beach. 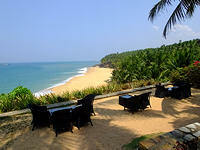 Next day is our hotel inspection day for the beach resort of Kovalam. First we visited the Niraamaya Retreat. This turned out to be a real surprise winner. The arrival to the hotel always gives a good first impression of what is to come. We arrived at a solid wooden gate simply inscribed with the hotel name & logo. There was nothing we could see beyond except palm trees & greenery.It has a look of a hidden secret. I liked it already. A security guard opened the gate and let our car drive in through a little drive round to the entrance of the resort. The reception is a large open space elegantly decorated with dark wooden panels, floor & antique furnishing with local arts & crafts. We stepped out onto the beautiful landscaped gardens with exotic flowers, plants and palm trees. We were shown to the exotic spa centre of the resort. This is the most beautifully laid out of any spa centre I have seen in any hotel. The centre is surrounded by palm trees, running water and fountains, exotic plants and sculptures. There are three types of room. The rose garden wing has modern rooms either on the upper floor with balcony or ground floor room with patio leading to the open garden. The interior is one long rectangular room with a sitting area by the entrance and a large four-poster bed with mosquito net It is bright, cool and relaxing. Other rooms in the gardens are more traditional in concept, with heavy dark wooden furnitures and beds. The third type of room is built like a traditional house. We saw the lovely 'Cinnamon' cottage resting on the tropical hillside with a view of the ocean and beach below. A beautiful solid wooden door with a bell on the side opens into a delightful interior constructed with doors, panels and shutters from old Kerala houses moved here. On the left is the elegant sitting room with wooden sofa and cushions looking out to a patio also with wooden bench and sofa. 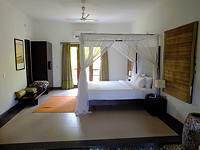 The beautiful four-poster bed with mosquito net is in the main room. The bathroom is in the private outside courtyard garden. It was so lovely. I wished I could stay there for the remaining two nights in Kovalam and we decided to move if the resort could find a room for us. While we went onto another two hotels our local Indian office contacted the Niraamaya to arrange a room. 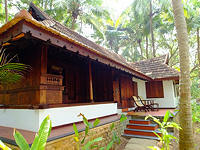 Next we visited Somatheeram Resort This resort is popular and well-liked by our clients. 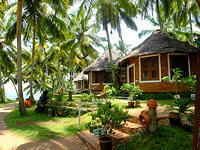 The resort is set in a lovely tropical gardens with individual cottage style rooms. The swimming pool is also surrounded by tropical gardens. The beach and the sea are a flight of steps down from the gardens. There is another resort nearby called the Manitheeram Resort run by the same company with similar room style and garden design. This is a newer hotel with the beach at the end of the gardens. 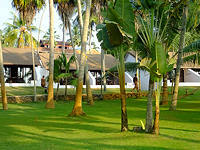 Both are excellent resorts and very strong on Ayuyveda treatments, yoga etc. We moved into the Niraamaya Retreat that afternoon. They have given us the Cinnamon cottage. From our hotel gardens we can walk down to two separate beaches. The hotel private beach is on the right with a long and almost empty stretch of sand and sea secured by some big rocks and land on both sides so very few outsiders are coming in. This is a wonderful place to relax and enjoy the peaceful environment. We went for a stroll along the empty beach before sunset. Most guests enjoy a sunset drink on the terrace overlooking the beach below and ocean beyond. Next day we spent the whole day on both beaches and the lovely swimming pool. The public beach on the left is also quite quiet too with a few swimmers and sun bathers. This is the place for relaxation, to enjoy the peace and its beautiful environment. There are birds, crows and kites, flying in the sky among the trees. I heard them in the morning in our room and at breakfast. I can hear the sea and waves at night time as well as at breakfast in the morning. We enjoyed our whole day doing nothing. 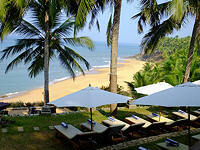 We are using this resort in our Deluxe hotels category. I would recommend anybody to come and enjoy it. Time to say farewell to both the beautiful resort of Niraamaya and our loyal driver, Shivan, as we took a flight to Mumbai.